A premium pearlescent white hand wash with the disinfecting properties of tea tree oil. Rich lather adds an element of luxury & elegance to any bathroom. Gentle ingredients leave skin feeling smooth, soft & refreshed. A premium antibacterial liquid hand wash to kill harmful germs and bacteria. Ideal for food services, health care & child care situations. 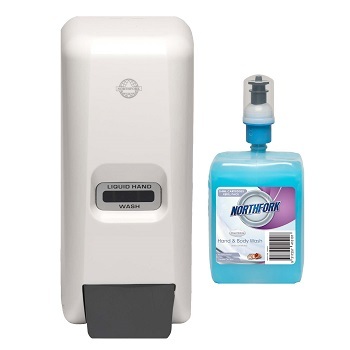 Starter kit with lockable dispenser and refill cartridges. Cartridge shrinks and empties to the last drop – no spillage, no waste. Low scented fragrance suitable for both male & female facilities. Dispenser made from resilient white ABS plastic with a gloss finish. Kit contains dispenser and 4 liquid hand wash 400 ml refill cartridges. In the 1970s, Richard Biffa introduced the skip bin into his waste business.Today, skip hire is one of the most profitable industries in the UK.